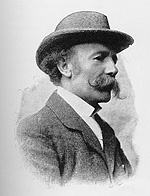 Frederick Morgan was born in London, England in 1847. His father John Morgan (1823-1886) was a genre artist who received his training in Paris France under the French painter and teacher Thomas Couture (1815-1879). He was known as “Jury Morgan,” after the success of one of his pictures entitled The Gentlemen of the Jury, and was a member of the Society of British Artists, as well as a regular exhibiter at the Royal Academy. (Oldcastle, pg. 4) As John Morgan firmly believed in the importance of learning art at a young age, he took his son Fred (as he was called) out of school when he was fourteen years old to begin his art instruction with him. Young Fred began his art training with his father and took some art lessons in Edinburgh. However, it was his father that greatly influenced his artistic career, as he said “He taught me how to make a picture.” (Oldcastle, p. 5) At age sixteen, Fred sent a painting entitled The Rehearsal to the Royal Academy, which depicted two old musicians practicing for the village choir. Much to his astonishment, it was accepted and was “hung in one of the small rooms on the wall, near the ground,” and was purchased by a collector at the Private View, for £20. (Oldcastle, pg. 8) After this initial success, Fred did not progress as he should have because “perhaps, being the only boy in the town of Aylesbury following the profession, thus lacking emulation, and also not being very robust in health, I seemed to lose heart.” (Oldcastle, pg. 8) Three years later, his father informed him that he was not qualified to become a painter and that he should look for another occupation. To that end, Fred’s father gave him five pounds and sent him to London, where he unsuccessfully searched for various jobs in warehouses or offices. He then returned home and decided with his family to once more try to become a successful artist. Fred worked for three years as a portrait artist in Aylesbury and was engaged by a photographic firm to paint family portraits for those clients who were not satisfied with photographs only. After showing samples of his work to other photographic firms in London, he received numerous portrait commissions and was thus able to make a sufficient income. The years that he spent working for the photographers proved to be a good training for Fred, as it “taught him how to observe closely and to give the greatest attention to detail.” (Oldcastle, pg. 15) In addition to portraits, he painted other subjects that included rustic idealized peasants and domestic genre mostly of happy childhood scenes. Starting 1874 Messers Agnew and Sons purchased all his work for a number of years. 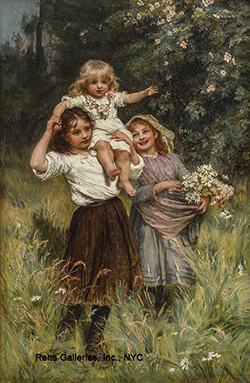 During this period he produced many of his successful paintings such as The Doll’s Tea Party (1874), Emigrants Departure (1875), School Belles (1877), which were mostly painted in the village of Shere close to Guildford, a favorite artists’ retreat. Later, he produced other paintings in Normandy, which included Midday Rest (1879) and An Apple Gathering (1880). 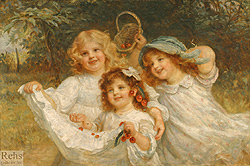 Fred’s popularity increased, as did the demand for his paintings of children scenes. Although he was an excellent child portraitist, he “had a problem painting animals,” as noted by Terry Parker in Golden Hours, The Paintings of Arthur J. Elsley, 1860-1952 (Somerset, England: R. Dennis, 1998, pg. 9) As a result, he cooperated with other artists for his images that depicted children with their pets. Among them were the artist Allen Sealey (1850-1927) who specialized in canine portraits, and the genre artist Arthur J. Elsley (1860- 1952). The latter took on that role when he moved into Fred’s studio at 7 North Bank, St, John’s Wood in 1889. 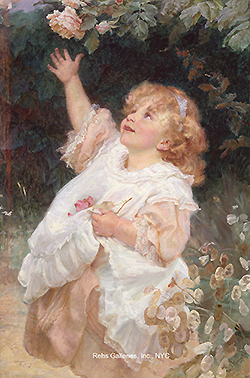 Together they produced Ruff Play (c. 1889, once owned by Rehs Galleries), in which Fred painted the little girl and Elsley painted the two terriers, among several other images. 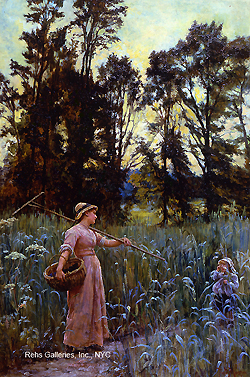 Fred’s scenes of idyllic childhood became so popular that thousands of reproductions of his paintings were made and sold. Among them were Now For The Baby Dogs (c.1891), a color chromolithograph that was offered with Father Christmas, (an annual children’s magazine). This issue of the magazine enjoyed great success to the extent that all three print runs of the magazine were sold out by mid December. Three photogravures of one of his best known paintings entitled Queen Alexandra, Her Grandchildren and Dogs (1902, dogs painted by T. Blinks) were hung in Buckingham Palace. Like his contemporaries, John Everett Millais (1829-1896) and Arthur Elsley, Morgan’s sentimental work was in high demand by advertisers. The Bath – His Turn Next (c. 1891) depicting children and a dog (painted by Elsley), and a Pears’ bar of soap serves as an example. Engravings of this image appeared in several publications including the back cover of The Gentlewomen, and Pears Annual 1915, and were also reproduced as a show-card illustrated in Modern Advertising 1926. Fred Morgan married three times. His first wife was the genre and landscape artist Alice Havers (1850-1890) and together they had three children. Their eldest son became an artist and exhibited landscape and figure subjects regularly at the Royal Academy under the name Val Havers. With his second wife, he had two children, one of whom also became an artist. During his lifetime Fred exhibited more than two hundred works at various exhibitions. These included the Royal Academy, the Royal Society of Oil Painters (of which he was a founding member), Burlington House, and the Manchester City Art Gallery. His works can be seen in the following museums and galleries in the United Kingdom: Harris Museum and Art Gallery, Lancashire; Towneley Hall Art Gallery and Museum, Burnley, Lancashire; City Art Gallery, Leeds; Walker Art Gallery, Liverpool; Russell-Cotes Museum, Bournemouth; and Lady Lever Art Gallery, Port Sunlight.